Ran into Bo Bice again today. Okay, so I slithered past a gaggle of hyperventilating female fans outside The N Club in Greensboro for a few closing minutes of the singer’s late afternoon sound check. While Bo and his band ripped through a few Southern Rawk standards, I shot the breeze with a few colleagues - telling them what little I knew about the former American Idol finalist. ‘He’s a righteous dude’, I told them, explaining that, much like Bucky Covington, Bice seems to truly appreciate the die-hard fans that a certain juggernaut of a show left in his care. 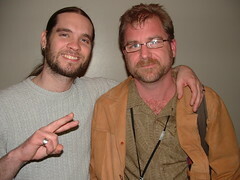 A few minutes later the laidback longhair proved me right, emerging from a back room to lay some love on Chaz Erwin - a certified Bo Bice enthusiast who just happens to live life in a wheelchair. Pretty standard protocol all right, but the Alabama native works the room with such genuine warmth that I always come away an admirer - even if I can’t name any of his songs. For a glimpse of said encounter, complete with an ugly shirt cameo by yours truly, click here. But brace yourself - it’s a really ugly shirt. Perhaps its my affinity for bearded cameramen, but I for one, would like to buy Olaf Wiig a hefty vessel of his favorite beverage. From all accounts, the New Zealand freelance photog was the proverbial pillar of strength during the thirteen days he and Fox News correspondent Steve Centanni were held hostage in Gaza. From diffusing his captors’ rancor to protecting his partner to telling his wife not to worry during that prison video, Wiig proved to be sharp, resourceful and more than a little dashing. Not bad for a guy who looks at life through a tube. (Then again, those who shoulder a lens on hostile soil are known for their verve - otherwise they’d be crankin’ out fluff statewide with the rest of us adolescents.) Now that Olaf and Steve are free and rested, they’re making the rounds at FNC, where they’re detailing their nearly two weeks of discomfort and uncertainty at the hands of unpredictable gunmen. Most telling of Wiig’s influence is the following exchange between the two seasoned colleagues during the first few hours of their captivity. S. CENTANNI: If we tried to sit up against the concrete wall to ease the tension on the shoulder and wrists, the plastic ties digging into your skin, they would let you sit there for a couple minutes and then push you back down again, face down on the cement floor. WIIG: ... by suggesting to Steve that this was a really good excuse not to do any more live shots that evening. S. CENTANNI: No more live shots today. WIIG: Yes, got off of the rest of our rotation. ...Bound and blindfolded on a dank warehouse floor while jumpy Jihadists brandish automatic weapons, Olaf giddily laments missing a round of meaningless live shots. Spoken like a true photog! Occasionally I get to park my camera in front of someone who deserves far more than the fleeting acclaim its lens delivers. Take Nat P. Walker. For eleven years he's served as chief groundskeeper for Thomasville's City Cemetery, slowly transforming the overgrown stone-garden into a few simple acres of gothic beauty. It keeps him occupied. Lately he's been worried about the crumbling state of the bronze plaques that decorate the graves of various war veterans. 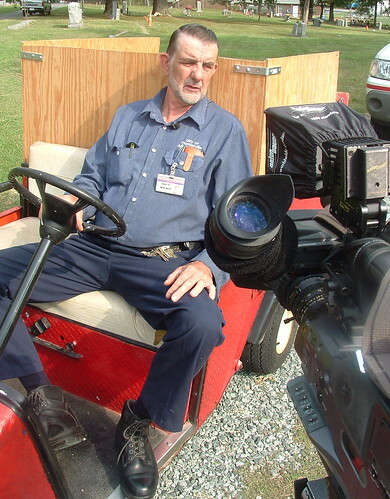 Not one to rest on his golf cart, ole Nat rang up his pal Congressman Howard "Mad Dog" Coble. Together they wrangled a mid-morning photo-op that brought out a gaggle of government wonks and one terminally distracted TV cameraman. When I asked Walker for a little pre-podium sound, he obliged - answering my questions with a polite, leathery growl. But his gruff exterior couldn't disguise an oddball wit. Wrapping up the interview, I asked the 61 year old if there was anything else he could think of. Ever so slowly, the crusty caretaker looked me dead in the eye and with a voice that would out-gravel Sam Elliot's asked, "You bring a covered-dish?" In the daily camera scrum, no one issue sparks a firefight quicker than the VJ debate. You know the scenario: All-purpose journalists with writer’s eyes, magic laptops and shrinky-dink lenses are threatening to take the ‘crew’ out of news crew. Only a couple of stations have bought into the idea so far, most under the tutelage of one Michael Rosenblum. To hear him tell it, this amalgamation of skills is an embittered industry’s only hope. His detractors cite his methods as the unforgivable dumbing-down of electronic newsgathering. Your humble lenslinger is somewhere in the middle, fiercely proud of his hard-earned solo skills, but still not sure he’d want to sit through an entire newscast of his own b-block masterpieces. Besides, at my shop, we produce far more varied fare: breathless live remotes from smoldering wreckage and political melees, esoteric think-pieces wrapped around invisible ideas and continuing team smotherage of the daily uproar. Chances are, your favorite station does too. 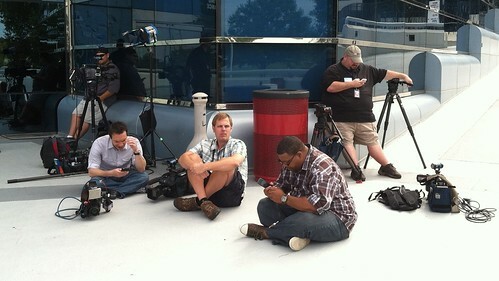 You’d think we TV news photogs would all be in favor of smaller, lighter cameras. You’d be wrong. Most who hold the heavy glass prefer it that way; trading a little lower back pain for a focal tube worth grappling with. 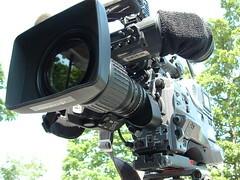 I’m fortunate enough to sling an 18 pound (or so) Sony XDCam, a rocket launcher of a video-camera. Shoulder-mounted on a classic chassis, the ergonomically taut optical disc recorder boasts more drop-down menus than most third-world defense systems. With it, I can incite a riot at ground level Mardi Gras or silently lay crosshairs on the crowd from some far off balcony tripod’s perch. It is a precision instrument that takes only seconds to power-up but a lifetime to master. It’s this question of weaponry that, for me, renders the VJ model mute. Quite simply, I don’t wanna take a toy into battle. I can dig the solo groove, squint ad peck at the magic laptops, even buy into about a third of the hokey proclamations of the discipline’s loopiest prophet. But dude, hands off my glass. When Stevie Ray Vaughan died in a 1990 helicopter crash, he was at the height of his powers. Newly sober and focused like never before, the Blues guitarist with the unbelievable tone was excited about the new music he’d never live to make. He was still in his stage-clothes when he passed, the echoes of a sold-out Alpine Valley crowd still ringing in his ears as the chopper crashed into a fog-enshrouded embankment. ‘Guitar Hurricane’ was suddenly no more. Across the planet, his fans clutched their CD’s, tapes and vinyl over the hole in their soul and marveled at the little Texan who could throw himself into a trance while the Gods played his Stratocaster. For a guy who yearned to be a grizzled old Blues Cat since he first learned to work the frets as a young teenager, dying in his early prime seemed crushingly unfair. It didn’t take long for that brief but brilliant career to transcend into legend. Unreleased tracks were parsed out in album form, books were written, a comprehensive box set was assembled and a handful of live performances offered on DVD. To the serious fan like myself though, it was never enough. Unsatisfied by the trickle of posthumous merchandise made of available, many of us did something that would bring a smile to Stevie’s ugly mug: we studied his Masters. Albert King, Lonnie Mack, Buddy Guy and quite a few others moved many a new unit thanks to Stevie, who never missed an opportunity to cite his influences. Yet we fans still yearned for more of the man himself. Which is why the advent of YouTube is so damn cool. Not just a repository for backyard fight scenes and other viral videos, the rapidly extrapolating site has become an archivist’s fantasy. Now with the click of a mouse, I can access more performances, interviews and homemade documentaries about the late great Stevie Ray Vaughan than I ever knew existed. Unimpressed? Fine, pick your favorite artist and do a YouTube search. But pack a lunch first - if you’re like me you’ll be there awhile, bolt-upright and agog at the breadth of your obsession. As for the legality of these on-line releases, much has yet to be worked out. Many will say their very availability robs my musical hero’s estate of profits earned. Perhaps, but something tells me the old rules of media distribution are as outdated as all those mid-80’s 'Guitar Gods' Stevie rendered so irrelevant when he still toured the Earth. Now if you’ll excuse me, there’s an acoustic version of ‘Testify’ that deserves my undivided attention.